It really solves the problem. Talking to people who'd use the product or feature is the best way to reduce risk. But how do you find these people? One traditional option is to hire a recruiting firm. For a fee (normally a fixed price per participant), they’ll crack open their database to find, schedule, and incentivize your participants. But quite often, time is short, budgets are tight, and your user base is very specific. In an increasingly Agile industry, recruiting through agencies is often too slow or cost-prohibitive. We’ve learned that for some studies, we can recruit on our own. In fact, a DIY participant recruiting approach can cost less, take less time, and yield more research participants. Where are your users likely to gather online? There are many self-serve platforms out there that help businesses connect with end users everyday. Although many of them are intended for advertising, there’s no reason they can’t be used to recruit. We’ve used Facebook, LinkedIn, and Google. Industry associations, popular blogs, and topic-specific online communities can also be good options. And, don’t forget the users of your own product or website – tools like Ethn.io and SurveyGizmo make it easy to embed pop-up intercepts that “grab” users in real time. Facebook's user base is vast, but each user generally only sees posts from those she follows – and even then, a secret algorithm is at play, governing what is shown to whom. To increase visibility, you can use the Facebook advertising platform or address your post directly to the public groups that would take interest in the topic of your research. Self-service advertising tools on LinkedIn and Google invite you to target the right people (and eliminate the wrong ones) using specific attributes like job titles, industry, geography, age, gender, company name, and company size. These pay-per-click ads are then presented on prominent pages of the site until your daily budget is exhausted. You’ve really struck gold if you find online discussions related to the problem you’re trying to solve, because that’s where you’ll find the eyeballs of people in search of a solution. Keep a running list of the industry associations, popular blogs, and topic-specific online communities where your users hang out. No matter where you promote your study, be sure that your post is concise, your offer is clear, and specific qualifying attributes are disclosed early on – you can save your budget and the user’s time by avoiding clicks from irrelevant parties. In most cases, the promotions you create in Step 1 will point into a screening survey, which will help you ensure that your recruits are truly representative of your target user. Establishing the screening criteria is the hard part. Once you’ve defined those questions, you can reuse them from study to study with minor variations. The screener is just like any web survey, but it’s designed to weed the qualified from the unqualified. Modern survey-building tools like Google Forms, Survey Gizmo, Survey Monkey, and Wufoo offer all the power you need. An example survey confirmation page in Google Forms directing the user to YouCanBook.me. When drafting your screener, remember to keep it simple but specific to what you’re trying to find out. Be mindful of how the questions are worded. Making sure the answers you’re looking for aren’t obvious will help control against that are solely interested in the incentive. Depending on each respondent’s answers, you can systematically bucket those who are qualified for an interview. And this is where things begin to get cool – you can send them directly to a page to select one of your available time slots. Once you've found a qualified participant, it’s time to get them scheduled. By this point in time, you've already identified internal attendees - a facilitator, a notetaker, and other key stakeholders. 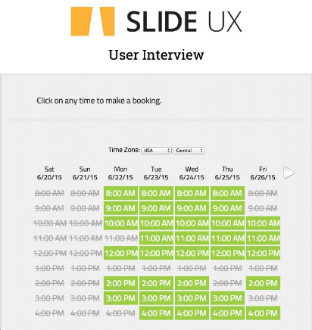 You’ll know the interview dates, and the team’s availability on those dates. After years of using Doodle.com, our team has recently switched to YouCanBook.me for automating this step in the process. YouCanBook.me offers available time slots to participants in their local time zone. When a slot is booked, a confirmation email and calendar invite are automatically sent, utilizing the content you prefer. See our templates here. Through trial and error, we’ve found that reminders are good way to reduce the no-show rate. At the beginning of a study, consider which types of reminders will work best for your study’s personas. Email, text, and voice may all be good options. When you draft these reminders upfront, anyone can jump in and send one quickly if things get hectic. Reminders should also explain how to reschedule. YouCanBook.me conveniently embeds links to reschedule and cancel into all communication. Depending on your audience, incentives can be a great way to attract participants. At the onset of each study, we think about the product’s personas and what they value. Do they shop at Amazon, or at Wal-Mart? Are they coffee drinkers? Would they appreciate something specific to the domain of our study, such as software or merchandise credits? Or are they power users who just want to see the product improved? To get the most from extending such an offer, mention it in the promotion, in the invitation, and in subsequent reminders. When we incentivize participants, ease of delivery is a key consideration. Digital incentives like gift cards and software credits are ideal because you can process each incentive quickly after a session concludes. The next time you embark on a round of qualitative user research, consider handling the recruit yourself. You can improve candidate quality, reduce costs, save time, and avoid hassles when you take participant recruiting into your own hands. Best of all, you’ll begin to develop a pool of candidates you can draw from for future rounds. With tools like Google Forms, Ethn.io, Boomerang, Doodle.com, YouCanBook.me, and self-serve ad platforms, your DIY participant recruiting program can be up and running within a couple of hours and booking participants soon thereafter. NOTE: The picture above is from April 23, 2015, when Erin shared this method with Austin IxDA (Interaction Design Association) in a session called DIY Participant Recruiting: A Hands-On Workshop. If your team would value an in-person working session on this topic, please get in touch.